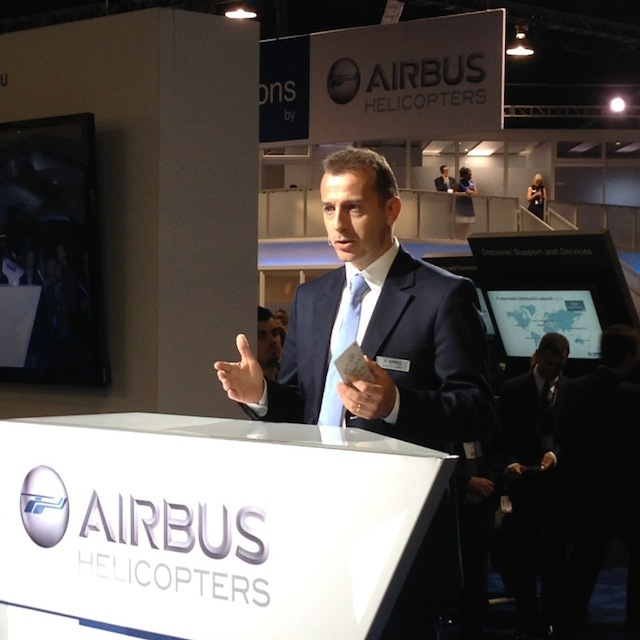 When I visited the HAI Heli-Expo 2014 in Anaheim, California, one of the priorities on my to-do list was to see a presentation by Guillaume Faury, the new president of Airbus Helicopters. But let’s focus on the future, not the past. I was delighted to see Guillaume Faury speak passionately about his vision of the future for Airbus Helicopter. With an emphasis on quality, safety and customer support, Mr Faury is a highly-experienced flight test engineer who has a deep understanding of his products. I felt very reassured by the experience which Mr Faury brings to his post. Reviewing Selected Airbus Helicopter Models. I’m a regular visitor to the Airbus Helicopter facility near Marseilles, France, but while I was at the HAI Heli-Expo I took the opportunity to speak with AH engineers and marketing people to review the aircraft which are relevant to my area of interest: VIP helicopters and operating helicopters from super yachts. With the EC175 you are buying into Airbus quality and technology. The EC175 is a brand new helicopter specifically developed with the long distance traveller in mind. This fast (175 MPH+) machine is a capable helicopter that was designed to go a long way out to an oil rig, and that long range will work just as well for the long distance traveller. The question for me is how many of our VIP clients are long distance travellers in helicopters. For the most part, ‘not many’ would be my answer. Will the EC175 become a game changer then? If the reports of its corporate jet noise-levels, smoothness of ride and available volume are to be believed, then Airbus Helicopters could have an attractive offer. Imagine London Battersea directly to Courcheval without refuelling and no changing to aeroplanes … and you can see the EC175 could deliver considerable time savings. The EC175 is already developed and, as of January 2014, completely certified. We will see the first VIP variant delivered in January 2016, I am delighted to say into the luxury yachting industry. In parallel – and this is equally exciting – the helicopter will be certified in Russia, with the UTAIR helicopter company as the lead customer. A question for me in the context of this Russian certification will be whether there will be some form of de-icing equipment available as an optional kit. I understand a decision will be made by Airbus in 2014 on this specific point. In summary, the VIP internal variants in terms of completion details and layout look both exciting and interesting. Pricing as always will be dependent upon what you specify, but we can start at around 7.4M€ and move up from there towards 8M€. At the HAI Heli-Expo I discussed the Mercedes Benz and Hermes variants with Airbus and they expressed a willingness to look at alternative colour options and even completion details. Personally, I welcome the option to buy a helicopter other than as a matching accessory for a car or handbag. The design and completion capabilities of Mercedes and Hermes are not in dispute, but applying that skill to the helicopter and being able to work in a way where the customer still choices regarding finish is an exciting development. Now that the EC175 is certified I hope that the delays in the certification of the Helionix avionics in the EC145 T2 will be overcome, and that the certification of the helicopter will be achieved in the coming months. To give the summary at the beginning, I think that range, speed and volume improvements will continue to keep this helicopter a leader in its weight class. A budgetary price would be approximately 5.5M€ with a delivery time of time of around 14 months. Eurocopter marked a new milestone in its product line enhancement strategy by launching the improved-performance, updated EC135 T3/P3 helicopter versions at the Heli-Expo 2013 industry show today, signing Air Methods of the U.S., Norsk Luftambulanse of Norway, and Italy’s Aiut Alpin Dolomites as launch customers. New features for these latest variants of Eurocopter’s EC135 light, multipurpose twin-engine rotorcraft include significantly improved hot/high performance, increased maximum takeoff weight, improved flight envelope, extended range, cockpit innovations and enhanced interior versatility. The T3/P3 designations signify availability of two upgraded engine options on the helicopters: Turbomeca’s Arrius 2B2 “Plus” for the EC135 T3; and Pratt & Whitney Canada’s PWC 206B3 for the EC135 P3.